Be the first to share your favorite memory, photo or story of Otila. This memorial page is dedicated for family, friends and future generations to celebrate the life of their loved one. 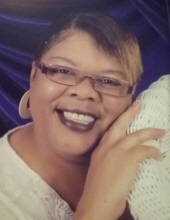 Seneca- Otila Sheree Breazeale, 53, of 819 Laing Court Apt. 811, passed away Friday, January 25, 2019, at the Cottingham Hospice House. Born in Seneca, SC, she was the daughter of the James Thomas Breazeale Sr. and Edna Lane Brown Breazeale of Westminster. Mrs. Breazeale was known to many as Tee or Tee Pot, retired from Beacon Manufacturing as a textile hemmer. Otila was a graduate of West Oak High School class of 1984, a founder of the Divine Security Ministries 2011 and later joined the Sisters of Saving Sisters Ministries, Otila had a great love for the homeless, drug addicts and prostitutes, she gave her heart to them, to help them considering where she thrived from. Mrs. Breazeale was a living testimony of her faith. As time progressed she became an active member of the St. Paul Baptist Church. Survivors include daughter, Mariah Daniels and her father Bernard Daniels both of Westminster; brother, James Thomas Breazeale Jr of Westminster; sisters, Tina Price of Seneca, Angela Breazeale of North Carolina and Elaine Earle and husband Mike of Seneca; two grandchildren whom she loved with all of her heart, Zion Williams and Kennedy Williams; numerous nieces and nephews; special friends, Ervin Lee Owens, Gail Breazeale and Georgia James. She is preceded in the death by her father. A Celebration of Life Service will be 1pm, Tuesday, January 29, 2019 at St. Paul Baptist Church. To send flowers or a remembrance gift to the family of Otila Sheree Breazeale, please visit our Tribute Store. "Email Address" would like to share the life celebration of Otila Sheree Breazeale. Click on the "link" to go to share a favorite memory or leave a condolence message for the family.